Registration deadline: 18th Jan' 2019. Afterward only on request. Submerge yourself in the peaceful detoxifying environment of Sahara desert and deepen your yoga and meditation practice, dreaming like in 1001 nights in the loving care of the Berber culture this spring 2019! Give your self time and space to relax , balance and recharge your body, mind and soul from the stressors of a long winter and discover a healthier and happier YOU. 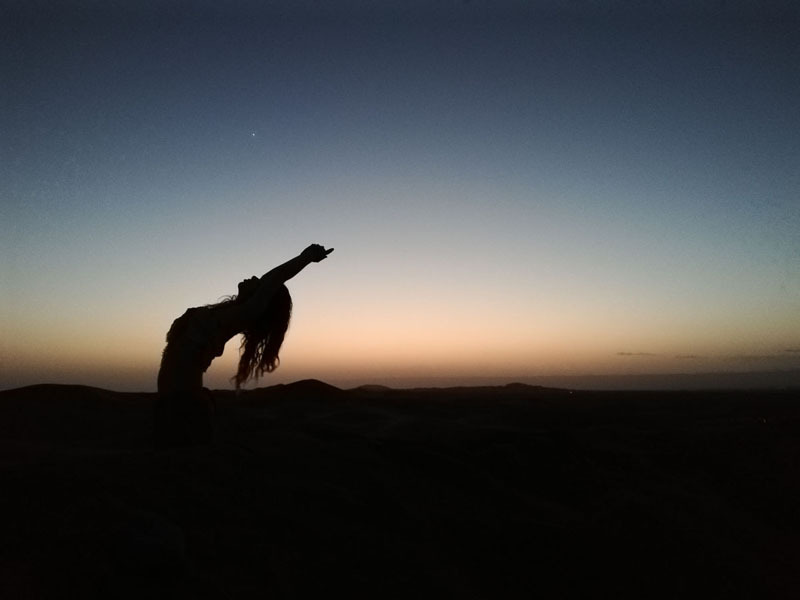 Whether you are new to yoga or deepening your existing practice, enjoy the restorative power of the serene landscapes of the desert as you relax in the endless silence while dromedary riding, meditate during breathtaking sunsets and watch the beauty of starry night skies. 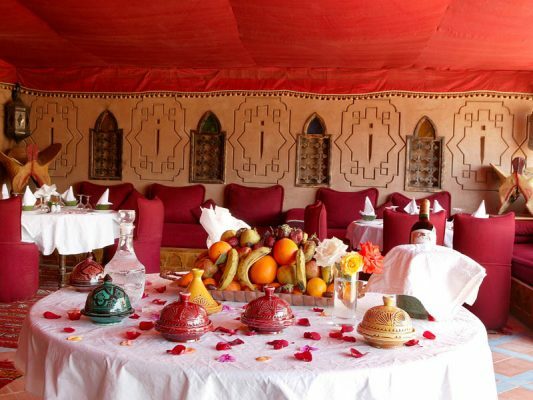 Let us bring out the treasures of your inner self through this magical experience in Morocco. The journey begins in the charming Marrakesh, passing through the mountains of the High Atlas and Anti-Atlas to Quarzazate, the Kasbahs Strait, through the impressive Draa Valley with its many palm oases, to a multi-day desert stay in Chegaga in a private comfort camp and silent dromedary trekking. 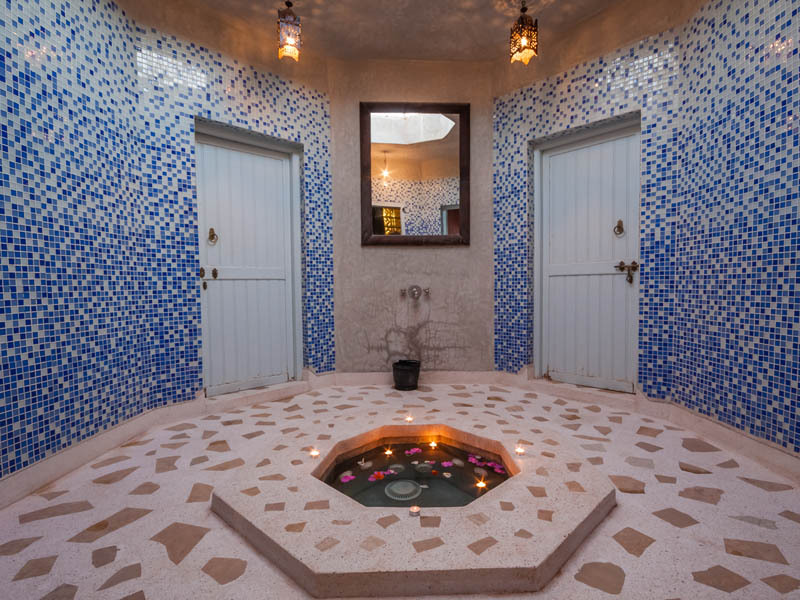 Then, we travel to the 4 stars Hotel Chez le Pacha in M´Hamid by dromedary where you can relax at the pool, enjoy the spa and Hamman and treat your self with a massage. In the last night , we will experience live Berber music too! 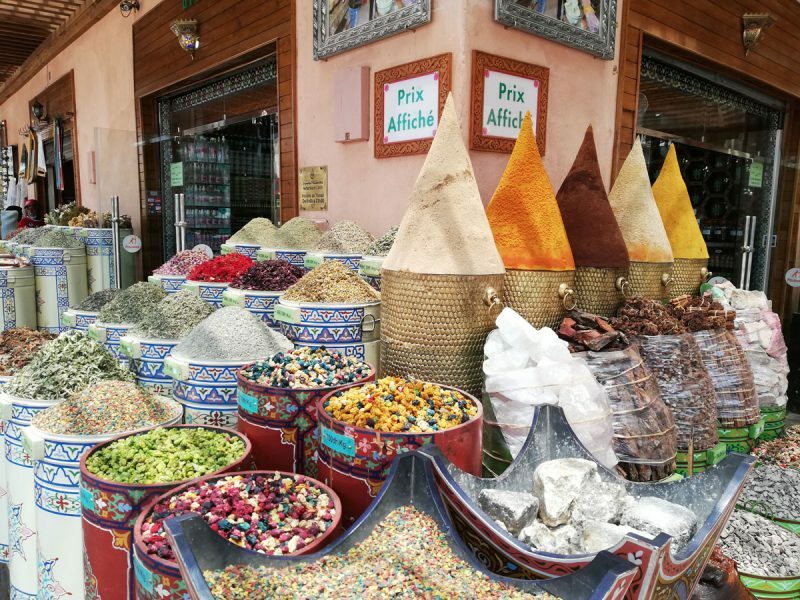 We finish in Marrakesh with free time to explore the night life of the mystical city, do some shopping in the famous Souks and eating traditional cuisine. 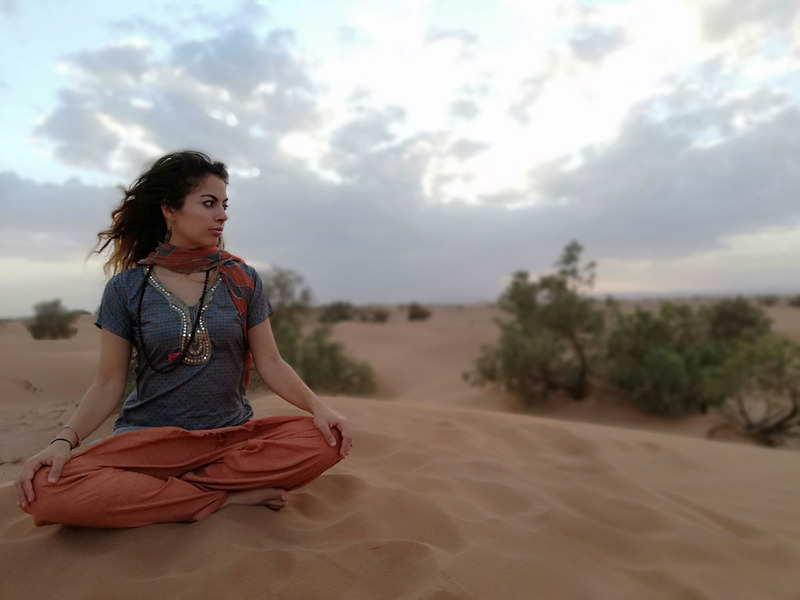 With daily yoga, pranayama, traditional and dynamic meditations including walking meditation and desert dancing, thai massage, uplifting awareness workshops and a healthy Moroccan vegetarian diet, you’ll feel inspired, renewed, refreshed, and rejuvenated! So grab your mat and join us for an unforgettable yoga detox holiday retreat! Cleanse, rest, rejuvenate, balance and nourish your body , mind and soul. Learn how to let go of the stress and tap into the inner rhythm of enjoyment, increasing your sense of happiness. Align your true nature to increase your self-esteem, strength and confidence which will improve all aspects of your personal and professional life. Develop inspiring and new living routines which will enhance your daily life with positivity and excitement to overcome any challenge in life and expand meaningful relationships. 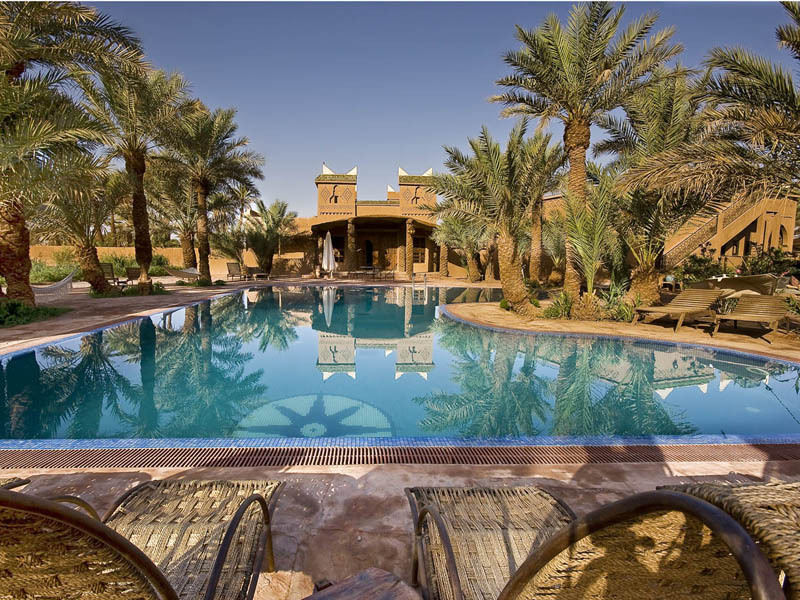 Discover the yogi and somatic tools through unforgettable experiences in the Sahara Desert and Marrakesh. Go home feeling inspired to life each day from your happier and healthier YOU! On our first and last day, we will travel to Marrakesh where we will stay one night in a beautiful Riad (large traditional Moroccan house). You will have free time to explore the famous and colourful Souks and the oriental streets of the Medina -market area- and enjoy eating traditional cuisine. 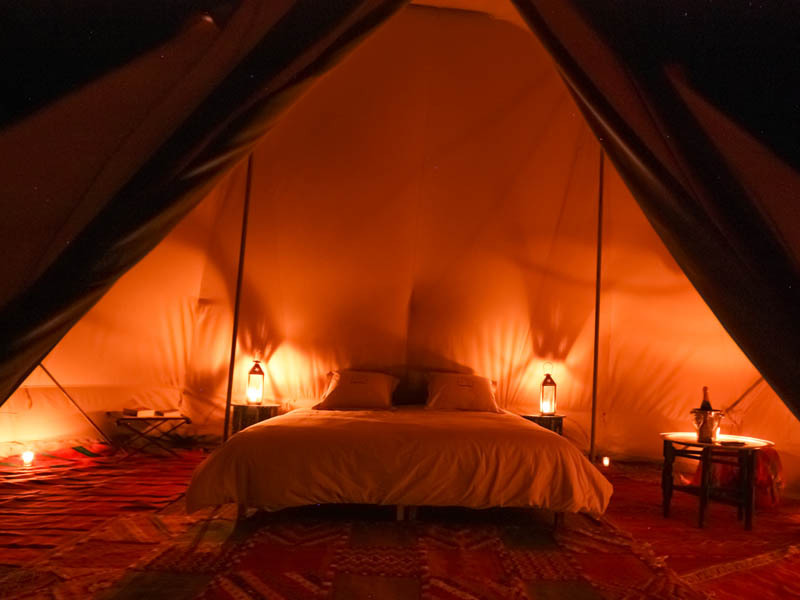 On our private comfort desert camp, tents will be provided and equipped with comfortable beds, showers and toilets. Our Berber team on board will take care of us with great hospitality and traditional folk Moroccan music! Before our last day in Marrakesh, we will stay and relax at Hotel Chez le Pacha, a traditional desert hotel with charm and all comfort. You can choose between 10 African lodges, 16 privilege rooms, and 4 suites. 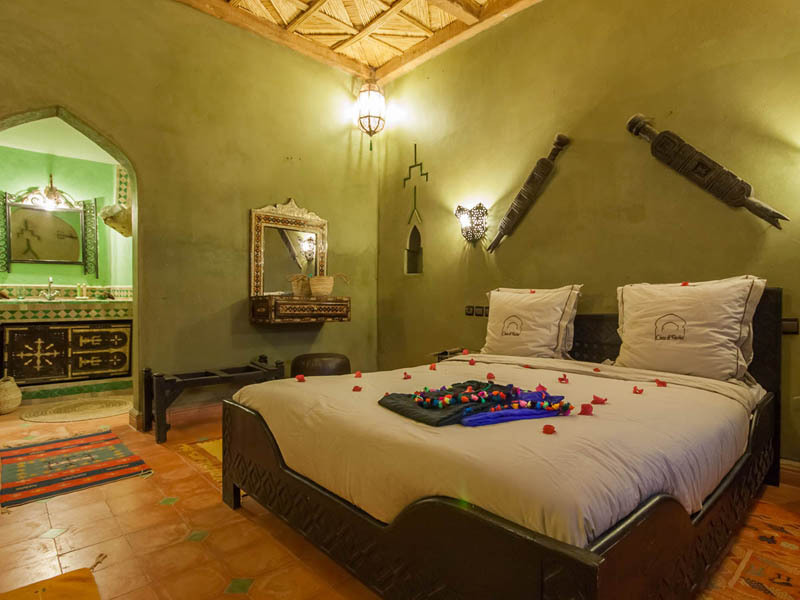 All of them are large and beautifully decorated bedrooms. The outdoor vista includes a refreshing swimming pool, restaurant- cafe and many cozy places to just sit-back, read, relax, enjoy the Moroccan sun, listen to the singing birds and enjoy amongst the palm trees, which will delight lovers of nature! During the warm evenings we will share dinner under the stars. All transfers to the accommodations and rides according to the program. Sightseeing according to the program by a experienced and multilingual professional local tour guide. 2 yoga & pranayama classes per day at the desert camp and the Hotel Chez le Pacha by qualified yoga teacher. Daily guided sunset meditation. From dance meditation, to sound healing and mindfulness sessions. Find the best that suits you! 3 Playshops: Desert dance meditation, The Yoga of Sound, The power of touch- Partner yoga, CI & Thai massage. An introduction to gratitude journaling and daily reflections. Free time to unwind, explore, connect with yourself, tune to nature and the others. Experience Morocco and get to know its beautiful culture. Laundry, gratuities and items of personal nature. *	Important: For all trips our conditions of participation apply. Travel terms and conditions: Since we practice yoga intensively, the renunciation of meat, fish and alcohol should be self-evident. The trips are private events and participation is at your own risk and on own responsability. Insurance (against accident, illness, theft, etc.) must be taken out by the participants themselves. 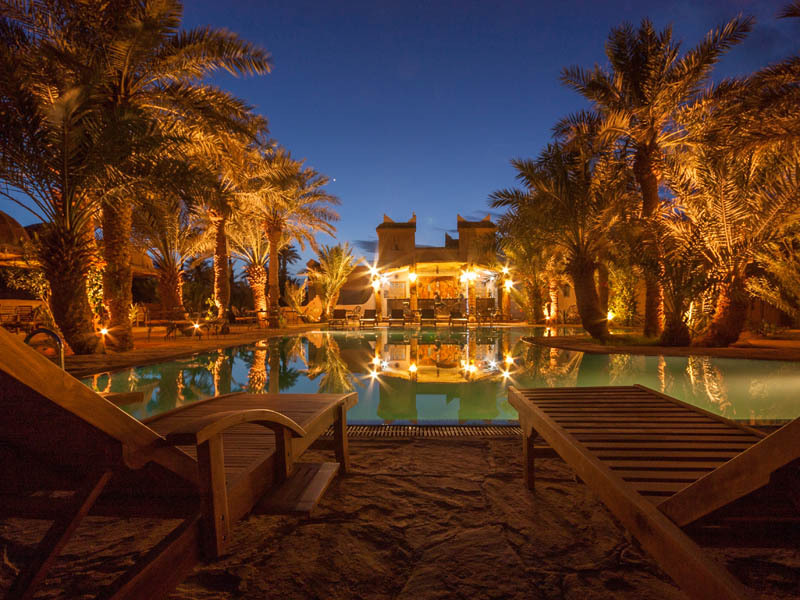 The Hotel Chez le Pacha and our private desert camp are the perfect places to relax. There are plenty of lounge areas to catch up on some reading, write in your journal and enjoy the sun. The use of the spa, quad bikes & buggies is also available (optional and at your own cost). 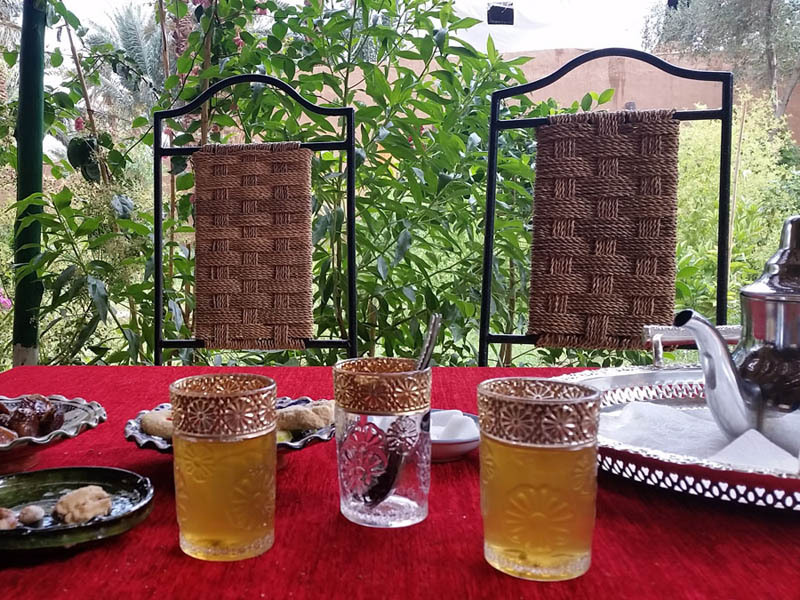 Breakfast in Riad. 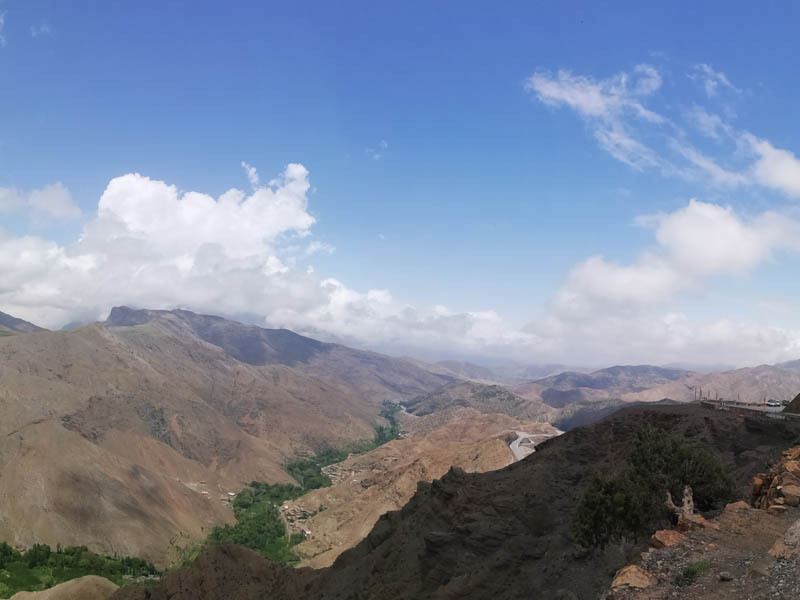 Travel to the desert, passing trough the breathtaking Atlas Mountains. Break for traditional Moroccan lunch and refresh in the swimming pool located in the restaurant. Welcome fire ceremony at our private desert camp. Dinner under the stars as in in 1001 Nights. 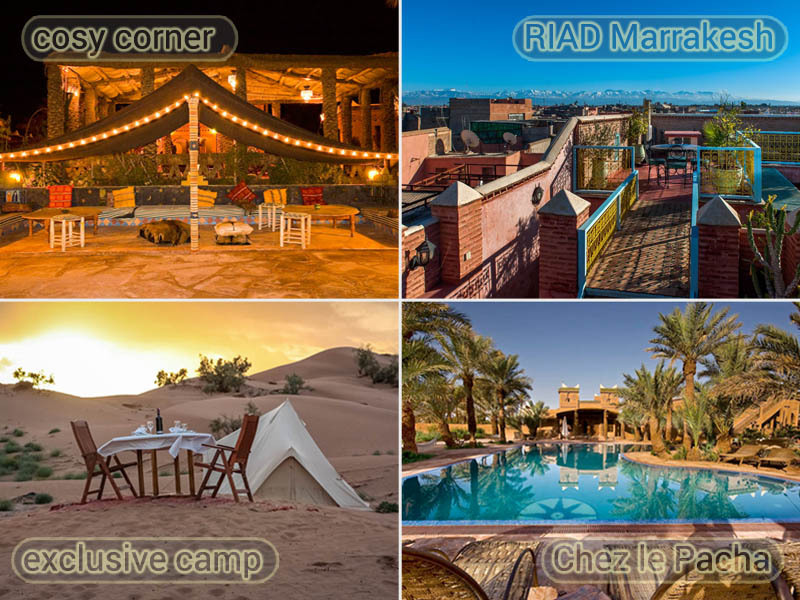 Sunrise meditation, yoga & breakfast in the desert and travel to the charming hotel Chez le Pacha in M’hamid by dromedary. Rest and explore the surroundings. Relax at the swimming pool and simply take it easy taking a massage or in a Hammam. Yoga in the evening “closing ceremony”. Dinner with traditional Berber life music. If you wish to stay longer in Marrakesh, please contact us to info@chezlepacha.com to book it extra at your own cost. 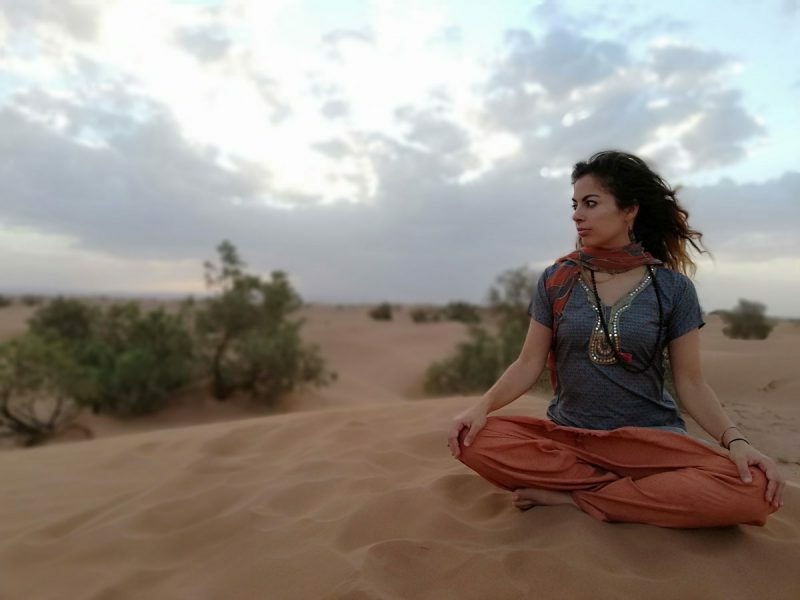 Discovering yoga while training as a professional dancer, using it in her career in dance theatre and as a way of staying injury-free whilst developing deep body strength, Carmen Mar’s yoga adventures have taken her to Thailand and India to learn yoga, meditation and the study of Thai Massage. She now runs retreats in various locations around Europe as well as teaching events and classes throughout Düsseldorf and abroad including traditional hatha, vinyasa flow, ashtanga, nada yoga, restorative and dance meditation classes. With a background in dance, Carmen Mar yoga teaching combines the thorough understanding of alignment, adjustments and anatomy with the joy of balance and movement. Her classes empower to improve the prana or vital energy, breath control, strength, mobility, coordination and flexibility and they are always revitalising and inspirational. Her unique and supportive style of teaching and her keen sense of humour leave the students with a smile on their face and softness within body and mind and elevate their ability to stay present, channel their inner strength and feel bliss. Carmen Mar continues her professional development by studying with acclaimed gurus including Usha Devi (CH), Mani Raman (IN), Parveen Nair (TH) Jules Febre and Gurmuk Kaur (USA). With a deposit of 50% you reserve your spot. The residue will be charged on the day of arrival. The deadline to book the Retreat will be the 18th of january 2019. After this date it is possible only on request. The Retreat will take place with a minimum amount of 4 participants. If less then 4 people are confirmed by the 18th of january, the Retreat will be cancelled and full deposits will be refunded. Transfers can be made to another name (if you cannot fill the spot), but not to another retreat or date. * If you don't participate in any of the included activities or excursions as listed in the schedule outlined, by your own choice or due to sickness, etc , no refunds will be given. Im kommenden Frühjahr ist es soweit! Tauche ein in die friedliche, reinigende Umgebung der Sahara Wüste und vertiefe dich in Yoga und Meditation. Dazu träumst du von 1001 Nacht unter der besonders liebevollen Fürsorge der Berber und ihrer Kultur. Gönne dir Zeit und Raum, um deinen Körper, deinen Geist und deine Seele, von den Stressfaktoren eines langen Winters zu entspannen, auszugleichen und aufzuladen und erlebe ein gesundes und glückliches Ich-Gefühl. Ob du das erste Mal Yoga praktizierst oder deine bestehende Praxis vertiefen möchtest, die Wüste gibt dir die nötige Inspiration. Spüre die Lebenskraft der beruhigenden Wüstenlandschaft beim Reiten auf dem Dromedar und genieße die endlose Stille. Mit atemberaubenden Sonnenuntergängen meditierst du und beobachtest anschließend die Schönheit des nächtlichen Sternenhimmels. Lass uns gemeinsam die Schätze deines inneren Selbst durch dieses magische Erlebnis in Marokko zum glänzen bringen. 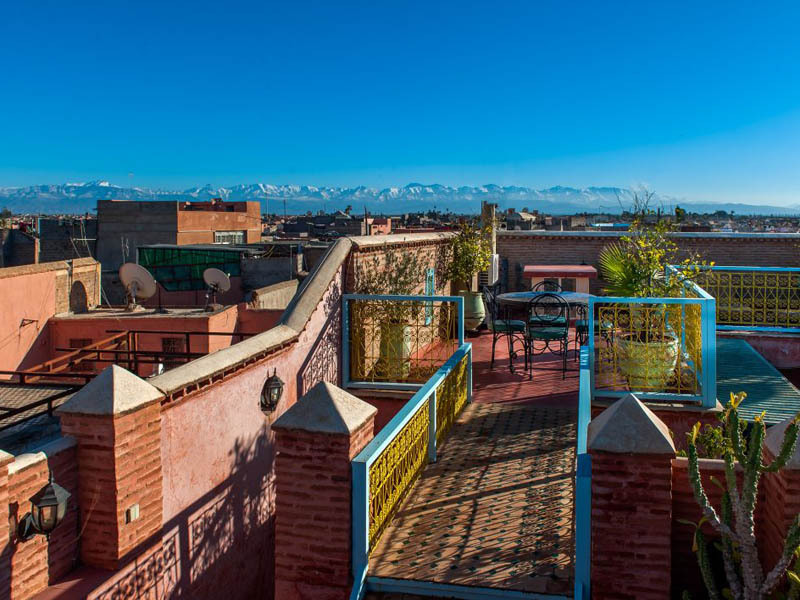 Die Reise beginnt im bezauberndem Marrakesch und führt durch die Berge des Hohen Atlas und Anti-Atlas nach Quarzazate. Weiter geht es auf der Straße der Kasbahs durch das beeindruckende Draa-Tal, mit seinen vielen Palmenoasen, zu einem mehrtägigen Wüstenaufenthalt in Chegaga, wo wir in einem exklusiven Komfortwüstencamp rasten und tagsüber die Umgebung still auf dem Dromedar erkunden. Anschließend reiten wir auf dem Dromedar zum 4 Sterne Hotel Chez le Pacha in M'Hamid, wo du am Pool entspannst, das Spa und Hamman genießt, dich mit einer Massage verwöhnen lässt oder einfach die eindrucksvolle Oase mit ihren einzigartigen Pflanzen und Tieren einatmest. In der letzten Nacht wird eine authentische Wüstenband uns mit traditioneller Berberfolkloremusik bezirzen! Am Ende landen wir wieder in Marrakesch und du erkundest das Nachtleben der mystischen Stadt genauso, wie du es möchtest. Mit täglichem Yoga, Asana, Pranayama, traditioneller und dynamischer Meditation, welche Geh- und Wüstentanzmeditation umfasst, Thai-Massage, erhebenden Bewusstseins-Workshops und einer gesunden marokkanisch vegetarischen Ernährung fühlst du dich inspiriert, gereinigt, aufgefrischt und verjüngt! Also schnapp dir deine Matte und begleite uns zu einem unvergesslichen Yoga Detox Urlaubserlebnis! Körper, Geist und Seele zu erholen, zu reinigen, auszugleichen, zu verjüngen und zu heilen. Zu lernen, wie du den Stress loslassen und deinen inneren Rhythmus des Genießens anzapfen kannst, um Glückseeligkeitsmomente intensiver wahrzunehmen. zu zeigen welche Natur in dir steckt, um gezielt dein Selbstwertgefühl, deine Stärke dein Selbstvertrauen zu steigern, was dein persönliches und beruflichen Leben positiv beeinflussen wird. neue inspirierende Lebensweisen zu entwickeln, die dein tägliches Leben positiv und aufregend gestalten, um die Herausforderungen im Leben zu meistern und bedeutende Beziehungen zu erweitern. durch unvergessliche Erlebnisse in der Sahara und in Marrakesch, Yoga und Somatics Werkzeuge für dich zu entdecken. nach Hause zu kommen mit einem Gefühl der Inspiration Tag für Tag von einem fröhlichen und gesunden Selbst! 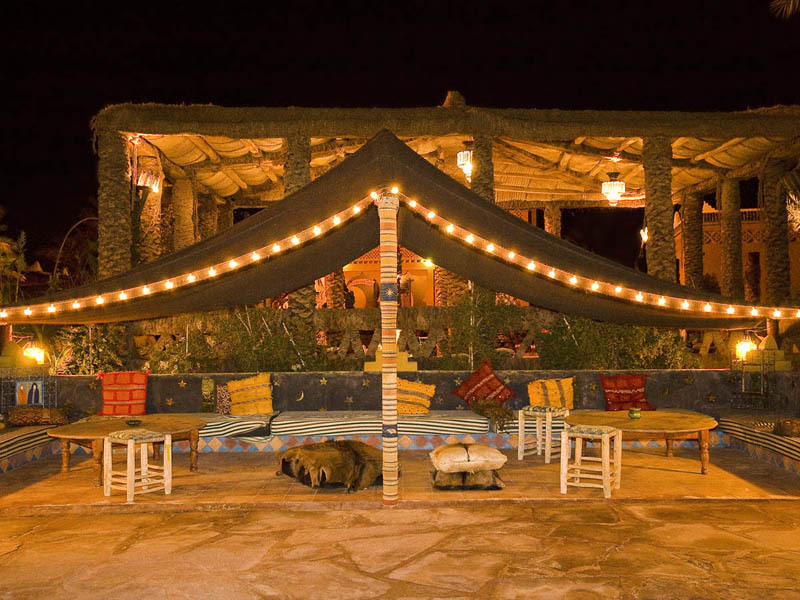 Am ersten und letzten Tag werden wir nach Marrakesch reisen, wo wir eine Nacht in einem wunderschönen Riad (großes, traditionelles, marokkanisches Gasthaus) verbringen werden. In eigener Freizeit kannst du die berühmten farbenfrohen Souks und die orientalischen Straßen der Medina (Altstadt) erkunden und die traditionelle Küche mit ihren aromatischen Gewürzen genießen. In unserem privaten Komfortwüstencamp werden Zelte bereitgestellt, ausgestattet mit bequemen Betten, eigener Dusche und Toilette. Unser Berber-Team an Bord wird sich voller Gastfreundschaft und traditioneller volkstümlicher marokkanischer Musik um uns kümmern! Vor unserem letzten Aufenthalt in Marrakesch werden wir im Hotel Chez le Pacha bleiben und entspannen, einem traditionellen Wüstenhotel mit Charme und allem Komfort. Je nach Wunsch auf Privatspäre und Extrakomfort, gibt es die Wahl zwischen einer afrikanischen Lodge, einem Privilege-Zimmer oder auf Anfrage einer Suite. Alle von ihnen sind große und schön eingerichtete Schlafzimmer mit voll ausgestatteten Badezimmer. Der Außenbereich bietet einen erfrischenden Swimmingpool mit Bar, einem Restaurant-Café und sehr viele gemütliche Plätze, um sich zurückzulehnen, zu lesen, zu entspannen, die marokkanische Sonne zu genießen, sich im Pool abzukühlen und als Naturfreund begeistert den Singvögeln unter Palmen und Blumenoasen zu lauschen. An den warmen Abenden werden wir gemeinsam Abendessen unter den Sternen genießen. Flughafentransfer bei Ankunft und Abreise. Alle Transfers zu den Unterkünften und Fahrten laut Programm. Sightseeing nach dem Programm von einem erfahrenen lokalen Reiseleiter. 2 entspannende Tage mit Pool (Spa, Sauna Hamman und Massage gegen Aufpreis). 2 Yoga- und Pranayama-Kurse pro Tag im Wüstencamp und dem Hotel Chez le Pacha von einem qualifizierten Yogalehrer. Täglich geführte Sonnenuntergangsmeditation. Von Tanzmeditation über Klangheilung bis hin zu Bewusstseinserweiterung. Lerne dabei, was am besten zu dir passt. 3 Playshops: Desert dance meditation, The Yoga of Sound, The power of touch- Partner yoga, Kontakt Improvisation & Thai massage. Freizeit zum entspannen, erkunden, in sich kehren, sich auf die Natur und Mitmenschen einzustellen. Marokko und die außergewöhnlich gastfreundliche (Wüsten-)Kultur kennenlernen. Wäsche, Trinkgelder und persönliche Gegenstände. * Wichtig: Für alle Reisen gelten unsere Teilnahmebedingungen. Reisebedingungen: Da wir intensiv Yoga praktizieren, sollte der Verzicht auf Fleisch, Fisch und Alkohol selbstverständlich sein. Die Reisen sind private Veranstaltungen und die Teilnahme erfolgt auf eigenes Risiko und eigene Verantwortung. Die Versicherung (Unfall~, Auslandkranken~, Diebstahl~, usw.) muss von den Teilnehmern selbst abgeschlossen werden. Das Hotel Chez le Pacha und unser privates Wüstencamp laden zum Entspannen ein. Es gibt viele exklusive Loungebereiche, wohin du dich entspannt zurückziehen kannst um zu lesen, Tagebuch zu schreiben oder die Sonne zu genießen. Die Nutzung des Spa, sowie Quads und Buggys sind ebenfalls gegen Aufpreis möglich. Frühstück im Riad. Reise in die Wüste, über das atemberaubenden Atlas Gebirge. Ergiebige Mittagspause unterwegs im Restaurant und nach Bedarf Erfrischung im Pool. Abends Begrüßungsfeuerzeremonie in unserem privaten Wüstencamp. Abendessen unter den Sternen wie in 1001 Nacht. Sonnenaufgangsmeditation und Morgen Yoga. Nach dem Frühstück Ritt auf dem Dromedar zum charmanten Hotel Chez le Pacha in M'hamid. Ausruhen und die Umgebung erkunden. Am Pool entspannen und bei einer Massage oder im Hamam verwöhnen lassen. Yoga am Abend "Abschlusszeremonie". Abendessen mit traditioneller Berber-Volksmusik. Mit ihrem Tanzhintergrund kombiniert Yoga Lehre von Carmen Mar das gründliche Verständnis von Ausrichtung, Anpassungen und Anatomie mit der Freude an Balance und Bewegung. Ihr Unterricht setzt physisch gezielt zur Verbesserung der Prana (Lebensenergie), Atemkontrolle, Kraft, Beweglichkeit, Koordination und Flexibilität an. Zudem ist er revitalisierend und inspirierend. Ihr einzigartiger und hilfegebender Unterrichtsstil und ihr ausgeprägter Sinn für Humor hinterlassen bei ihren Schülern ein Lächeln auf dem Gesicht und Geschmeidigkeit in Körper und Geist. Carmen hilft ihren Schülern im Jetzt zu sein, die inneren Stärke zu bündeln und Glückseeligkeit zu empfinden. Beruhigt und gleicht den Geist und Körper aus. Verbessert die Durchblutung und die Flexibilität. Die Meridian-Stimulation bringt die Organe ins Gleichgewicht. Eine Anzahlung von 50% ist Voraussetzung zur Reservierung. Der Restbetrag wird vor Ort beglichen. Bitte buche das Retreat über die Chez le Pacha Internetseite und schreibe mir anschließend eine kurze Benachrichtungs-Email an contact@carmenmar.com! Anmeldeschluss ist der 18. Januar 2019. Danach erfolgt die Buchung nur noch auf explizite Anfrage. FÜR DEN SPECIAL GROUP DISCOUNT SCHREIBT MICH BITTE VORHER DIREKT AN! Die Mindestteilnehmeranzahl beträgt 4. Im Falle, dass bis zum 18. Januar 2018 weniger als 4 Teilnehmer angemeldet sind, muss das Retreat ausfallen. In diesem Falle werden die Teilnehmer informiert und sämtliche Anzahlungen werden zurückerstatten. Die Übertragung auf einen anderen Namen ist bis einen Tag vor Beginn möglich. Es ist nicht möglich den Reisezeitraum oder zu einem anderen Retreat zu wechseln. * Wenn Sie sich entschließen, an einer der im Plan aufgeführten Aktivitäten oder Exkursionen nicht teilzunehmen, wird keine Rückerstattung gewährt. 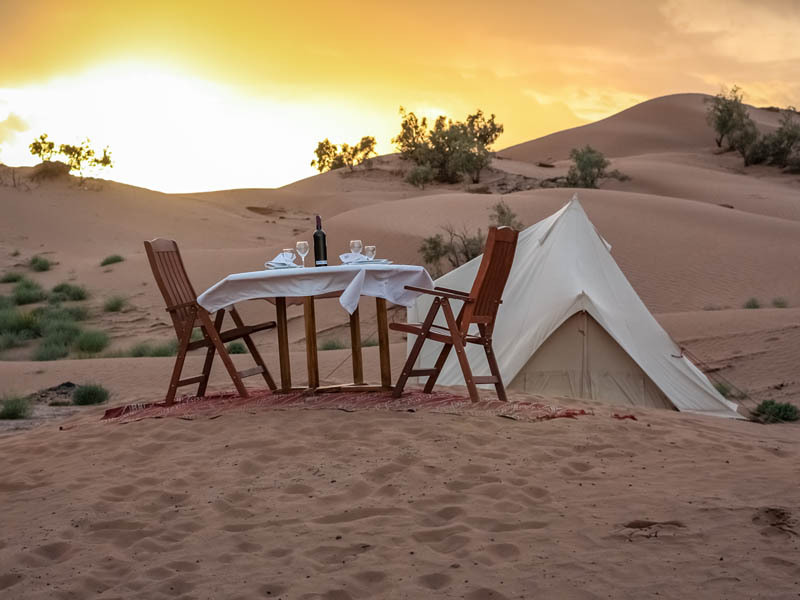 Sumérgete en el ambiente tranquilo y purificador del desierto del Sahara y profundiza en la práctica del yoga y meditación, sintiéndote protagonista del cuento de las 1001 noches y dejándote mimar por la cultura bereber esta primavera 2019! Dedícate tiempo y espacio para relajarte, equilibrarte y recargar tu cuerpo, mente y espíritu del estrés acumulado durante el largo invierno desconectando de los excesos (de prisas, de obligaciones, de responsabilidades, de uso de las tecnologías, etc…) y descubre las herramientas necesarias para disfrutar de una vida más saludable y más feliz. Dirigido a personas con o sin experiencia en la práctica del yoga, que buscan conectar con la calma interior a través de enfoques integradores en el ambiente natural, inspirador y restaurador del desierto, con impresionantes puestas de sol, paseos en dromedario y noches estrelladas. Restaurarte, descansar, rejuvenecer, encontrar el equilibrio cuerpo, mente y alma. Aprender a dejar de lado el estrés y incrementar tu sentido de la felicidad. Reconectar con tu verdadera naturaleza para potenciar tu autoestima, fuerza y confianza para mejorar todos los aspectos de tu vida personal y profesional. Desarrollar rutinas de vida necesarias para disfrutar de una vida más saludable y más feliz. Ello contribuirá a mejorar superar los retos de tu vida diaria con positividad y ampliar las relaciones significativas. 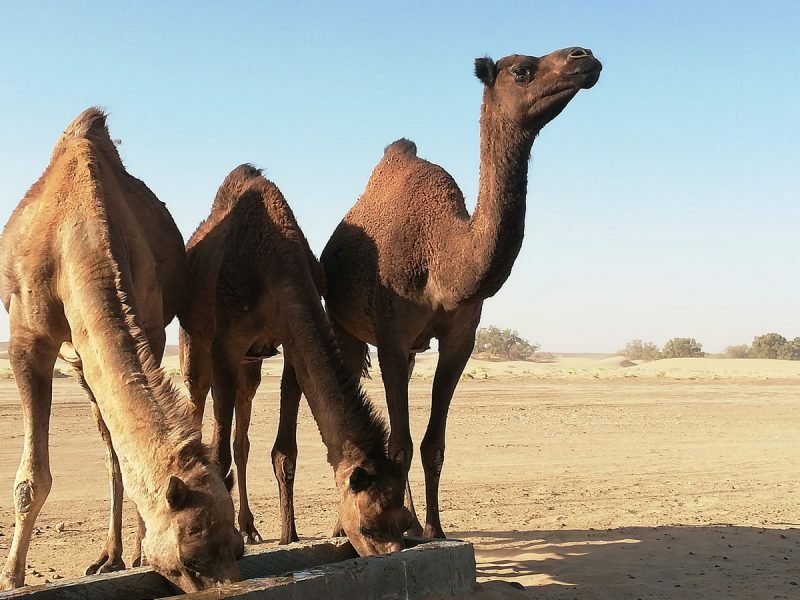 Descubre las herramientas del yoga y somáticas a través de inolvidables experiencias en el desierto del Sahara y Marrakech. ¡Vuelve a casa sintiéndote inspirad@ para vivir la vida todos desde un TÚ más feliz y más saludable! Vamos a sacar los tesoros de tu yo interior a través de esta experiencia mágica en Marruecos. El viaje comienza en la encantadora ciudad de Marrakech, de ahi viajaremos a través de las montañas del Alto Atlas y Anti-Atlas a Ouarzazate, el estrecho Kasbahs y el impresionante valle del Draa con sus numerosos oasis de palmeras y llegaremos a Chegaga donde realizaremos una estancia en el desierto de varios días en un campamento privado confort y podremos profundizar de sesiones de yoga, meditación, talleres y paseos en dromedario. Luego, nos desplazaremos al Hotel de 4 estrellas Chez le Pacha M'Hamid en dromedario, donde podremos relajarnos en la piscina, disfrutar del spa y baño turco y relajarse con sesiones de masaje. ¡Y en la última noche, podremos disfrutar de música beréber en directo para despedirnos! Terminamos en Marrakech con tiempo libre para explorar la vida nocturna de la ciudad mística y visitar el Zoco o gran mercado donde poder encontrar bonitos souvenirs. 6 noches en nuestro campamento privado en el desierto y Hotel Chez Le Pacha. 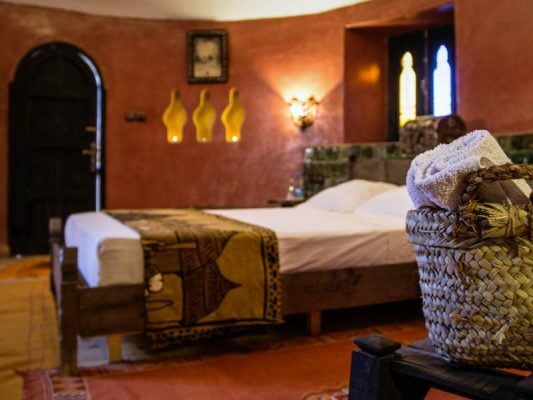 2 noches en Marrakech en un hermoso Riad. 2 clases de yoga y pranayama por día. Práctica dinámica en las clases yan (Hatha, Vinyasa Flow) y clases restaurativas yin. Para todos los niveles y edades. Danza meditativa, baños de sonido y sesiones mindfulness en el ambiente mágico del Sáhara. Introducción a tu diario de gratitud y reflexiones diarias. Turismo guiado según el programa realizado por un guía profesional local. Cena de despedida con música bereber en vivo y bajo las estrellas. 2 días relajantes con piscina en Hotel Chez le Pacha. Uso opcional del spa, sauna, hammam y masajes. Desayuno en Riad. Viaje al desierto, pasando por las impresionantes montañas del Atlas. Almuerzo marroquí y refrigerio en la piscina. Ceremonia de fuego de bienvenida en nuestro campamento privado en el desierto. Cena bajo las estrellas como en las 1001 Noches. Permanecemos en el campamento con la práctica diaria de yoga, pranayama, meditación talleres, paseos en dromedario, meditación de baile en el desierto, diario de gratitud y mucho más. Meditación al amanecer, sesión de yoga y desayuno en el desierto. Después nos desplazaremos al encantador hotel Chez le Pacha M'hamid en dromedario. Tiempo para descansar y explorar los alrededores. Relajarse en la piscina y posibilidad de tomar un masaje o disfrutar en un hammam. Yoga en la noche "ceremonia de clausura". Cena con música tradicional bereber. Descubrió el yoga como bailarina profesional, e.j Cirque du Soleil y Deutsche Oper am Rhein y con ello inició sus aventuras la han llevado a Tailandia e India para profundizar en el yoga, la meditación, el estudio del masaje tailandés y las terapias con el sonido. Ahora dirige retiros en varios lugares de Europa y ofrece clases y eventos regulares en Düsseldorf, Alemania y en el extranjero, incluyendo clases tradicionales de hatha, vinyasa flow, ashtanga, nada yoga, restaurativas y meditaciones a través de la danza. Actulamente, continúa su desarrollo profesional estudiando con gurús aclamados internacionalmente como Usha Devi (CH), Mani Raman y Mohan (IN), Parveen Nair (TH) Jules Febre y Gurmuk Kaur (EE. UU.). Con la práctica diaria de yoga, pranayama o ejercicios de respiración, meditación tradicional y dinámica ej. Mindfulness, Meditación al caminar, danza meditativa en el desierto, talleres de conciencia corporal, mental y espiritual y una deliciosa dieta saludable marroquí, te sentirás inspirado, renovado y más reconectando con la esencia de cada uno. Coge tu esterilla de yoga y únete a nosotros para disfrutar de unas vacaciones inolvidables! *The early bird price reduction is valid until the 31th deziembre 2018. La fecha límite para reservar el Retiro será el 18 de enero de 2019. Después de esta fecha, es posible solo bajo petición.